Subjects, styles, advertising, other relevant information: Daughter of a carpenter, Dora was employed as a photographic retoucher, aged 19 years, living at home in Cherryhinton Road Cambridge, with her parents in the 1911 census. Dora Apthorpe became a member of the Cambridge and District Photographic Society (proposed in the minutes of 6 Jan 1920). She was listed as a photographer in the Kelly's Directories 1922-1933. In the 1939 Register Dora was living at 23 Grantchester Street with a Florence E Severs. Dora's occupation was shown as a heraldic artist. Florence was a draftsman. Kellys Directory of Cambridge 1922-1933. 1939 Register. References: England Census 1911, 1939 Register. Name: ARNSBY, John b. 1884 d.
Subjects, styles, advertising, other relevant information: Listed as William J Arnsby, a stationer and photographer in Kelly's Cambridgeshire Directory 1900-04. However, his name is slightly different in the census returns. In 1891 his name was shown as John E W Arnsby and in 1901 he was shown as John B W Arnsby. In 1901 he was shown as a stationer and photographer. He was the son of John Arnsby b: 1836 Bridgestock Northamptonshire who was the licensee of the Black Bull public house in Almshouse Street, Whittlesey. Name: ASHWORTH, Flora Edith b. 1895 Wisbech d.
Subjects, styles, advertising, other relevant information: Flora is listed in the 1911 England Census as a photographer (learner) and an employee. She was living with her parents. Her father, Alfred Ashworth b:1849 Wisbech was a master printer. Address: 6 Broad Street, March, 27 Dartford Road, March. Subjects, styles, advertising, other relevant information: Alice Askew was the daughter of George Askew, b: Tiverton Devon, and Elizabeth Askew b: 1838 Church Stanton Devon. George was a tailor and draper, employing three women. George died in December 1870 shortly after Alice was born. Elizabeth, then a widow with a young family continued to run the business as a tailor and draper at 8 East Street South Molton Devon at least until 1881. By 1891 Elizabeth had set up as a photographic artist and young Alice was her assistant. Elizabeth may have done her photography alongside her earlier business as in 1901 she was described as both a shopkeeper and photographer, still assisted by her daughter Alice. Elizabeth was still shown as a photographer in the 1911 census, but no longer assisted by Alice (Her assistant in 1911 was Lilian May Mew b:1885 Newport Isle of Wight). A number of albums of Elizabeth's photographs survive in the South Molton Museum and 14 of her landscapes and portraits were recorded at Stationers Hall for copyright purposes. Having gained her photographic skills working for her mother, Alice moved to Cambridgeshire around 1910. By 1916 she was the manager of the March studio of Wisbech photographer J Lawrence Brown. 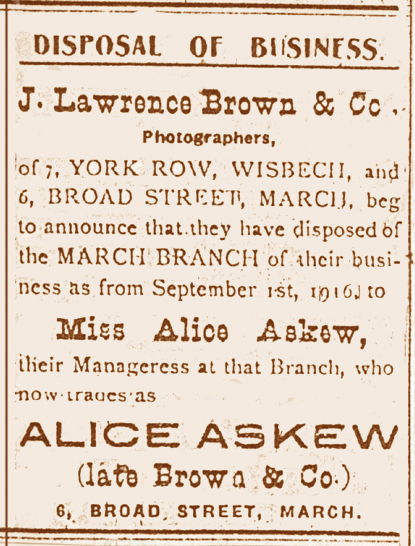 The advertisement below from the Cambridgeshire Times in September 1916 marks the point when Alice bought the March Studio from Brown and started to trade on her own account as Alice Askew, (late Brown and Co). This would have been a risky point to start a photographic business with difficulties sourcing materials as well as limited demand, but Alice made this into a successful business which was to run for the next 37 years. Alice, already an experienced photographer, with a centrally placed studio, became the principal photographer in March from this point until 1953 when she retired and sold her business to Cochrane and Clark. During her working life in March Alice also became the main local photographer for the Cambridgeshire Times. Alice died in March 1963 aged 94. Her obituary states that besides the great interest in her work she enjoyed music and was a member of March Choral Society. She was also a faithful communicant at St Peter's Church. Alice is listed in local directories as a professional photographer at 6 Broad Street March from 1922 to 1937. She is listed in the 1939 Register as a photographer living at 27 Dartford Road, March. This was her home address at the time of her death. 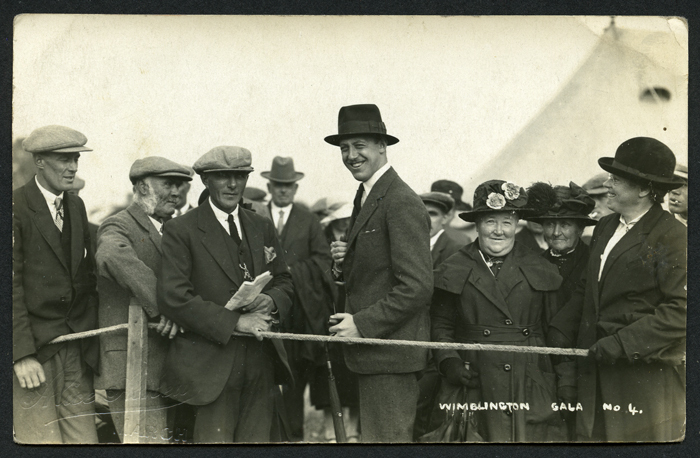 Below is a real photograph postcard of Wimblington Gala from the 1920s. The reverse is printed as a divided back postcard and the photographer's name is embossed with an embossing machine in the bottom left hand corner. 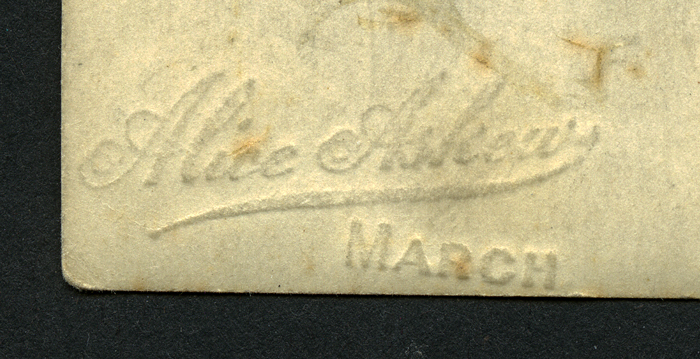 The embossing is shown from the back of the postcard, photographically inverted to be readable. 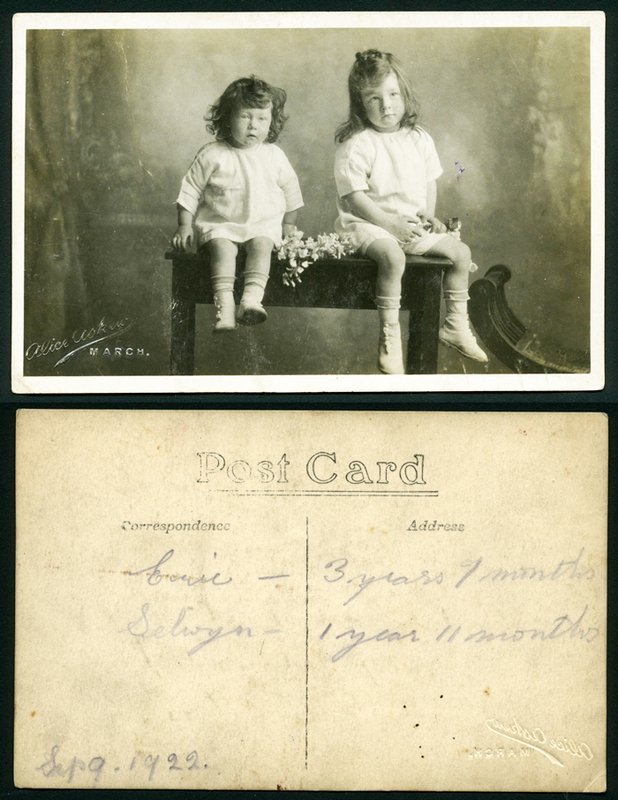 Below this is a dated portrait of two children from 1922 in postcard format. The lower left hand corner has the same embossing as the previous example. 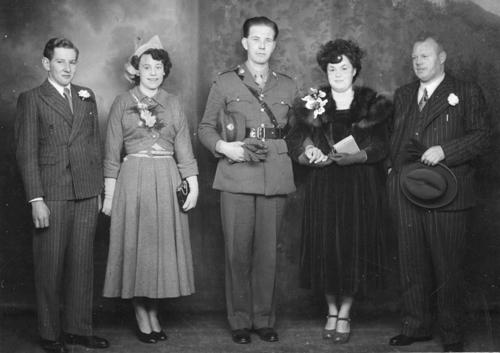 The next example below is a wedding group photograph, 5.75 in x 4 in, mounted on cream card with sepia line and printing "Alice Askew March". The mount has a silver edge and is covered by a paper cover with silver horse shoe and heather design. This appears to be from the 1930s. References: We are grateful to Nick Smith for much of this information about Alice's life. Mike Petty, The Photographers, (a handlist of local photographers), Cambridge, Cambridgeshire Collection, 1992. Subjects, styles, advertising, other relevant information: industrial, commercial, pamphlets, weddings, passports, colour laboratory (1977). 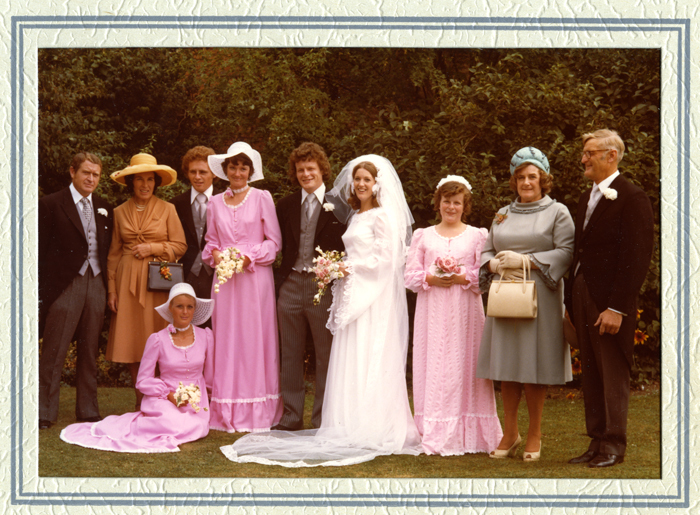 See below an example 5in x 7in colour wedding photograph from the late 1960s or early 70s in cream grained card fold over mount with rubber stamp on the reverse of the mount "Aspect Photo Services 127 Eastfield Road Peterborough Tel Peterborough 53158". Lack of postcode suggests pre 1974 and 5 digit Peterborough telephone number pre ? Name: ASPLAND, Miss C b. d.
Kellys Directory of Cambridgeshire 1922. Subjects, styles, advertising, other relevant information: Talented local photographer who documented life in her home village of Wicken. Her work was exhibited retrospectively by the Cambridge Darkroom in their Fen Archive exhibition in 1986. Many copies of her work are in the Anthony Day Collection. Subjects, styles, advertising, other relevant information: fashions and weddings. Azure photography also at this address in 1990.